It’s not a big place, but it has big atmosphere and an owner with credentials to match the ambience. Justin Hindman opened Gent’s Classic Men’s Haircuts less than a month ago. "My family buys and fixes up property for resale and lease," says Hindman. "When we saw this place, we wanted to preserve it for its historical value, and I wanted my shop there." Hindman is a licensed cosmetologist in Georgia and Tennessee and a master cosmetologist and educator. "I’m a classically trained stylist," he says. "I’ve been doing this for nine years." The small, free-standing building that is his new shop sits on Reed’s Bridge Road near Dietz Road. It was built in 1940 as a barber shop and has served that purpose for 77 years. Hanging on a wall is a photo collage of W.C. Wingo, the barber who owned and ran the place for many of those years. "I wanted to honor the former owner, who has since passed away," says Hindman. "So many men in this community got their hair cut by him. He was part of this area’s history." Wingo would be pleased to see his building today. A porch has been added, there are new walls, new floors, a new ceiling, all new equipment. Walk in and you’ll find a place where any man would be proud to get his hair cut or styled or his beard trimmed. "I did 85% of the remodeling myself," says Hindman. Gent’s Classic Men’s Haircuts is located at 5595 Reed’s Bridge Rd., Ringgold. They can be reached at 706-406-0600 or roguestylez4u@gmail.com. You can find them on Facebook at facebook.com/Gents-Classic-Mens-Haircuts-1737361469909896. Hindman, who refers to himself as Christian and conservative, gave a lot of attention to creating a look in his shop that he felt would appeal to men – wood, brick, black and red. There’s coffee and snacks, newspapers to read. There’s music, ranging from classic rock to the blues and big band. The music gives way to sports on the wall-mounted flat screen TV when there’s a good game on. The shop has free Wi-Fi and plenty of comfortable seating for customers waiting their turn or guys just wanting to hang out. Something else that’s different about Gent’s is the hours. "Men want quality," says Hindman, "but they also want convenience. They can’t always take off work to get their hair cut." For that reason, Gent’s is open Monday through Saturday, from 9 a.m. to 7 p.m.
Gent’s carries Reuzel pomades and other Reuzel products for hair and beard care and styling. "A lot of today’s styles," Hindman says, "keep better with the aid of pomade or balm." Eight-year-old Cash Lloyd recently received the Reuzel treatment after a stylish cut at Gent’s. "We had an amazing experience there," says Cash’s mother, Tiffany. Hindman assured the pair that a little Reuzel pomade would keep Cash’s style intact "through two gym classes." 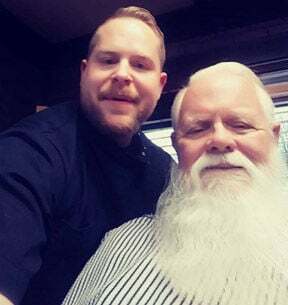 Possibly the most famous customer Hindman has served is Santa Claus, who stepped into his shop just days before Christmas for a haircut and beard trim. Hindman got him spiffied up in style for his annual sleigh ride, so when the wind whipped his hair and beard tither and yonder, he’d return to Mrs. Claus looking as dapper as always. 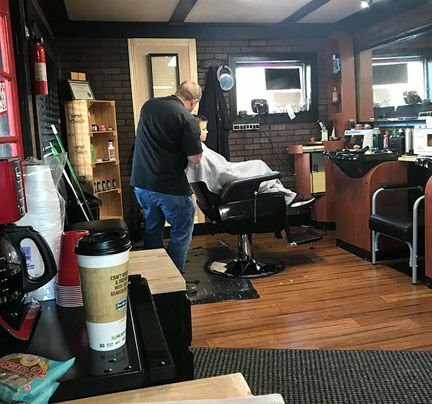 Hindman plans to offer free haircuts to veterans and military personnel on Veteran’s Day and is planning some Sunday events for children with special needs who might normally be shy or intimidated being the center of attention in a public place. "I support our military and law enforcement, and I want to help my community," he says.